"As a parent/host, and compared to other party locations, I was able to enjoy the party and not have to do anything. All the details were taken care of and went perfectly. The facility was so muuch fun and all the kids had a blast. I'm so happy we had our party at BounceU!! "Your staff is phenomenal! They kept the party organized and I didn't have to worry about anything. I would not hesitate to book again! I was even excited that they wrote down all the gifts that my daughter received. This was the first party that I actually enjoyed myself!" "10/10! I always recommend BounceU. We've had 5 parties here and many more to come!" "The party pros were very attentive and helpful with a very positive attitude. They were more than happy to help with anything and were constantly monitoring the children jumping, and ever helped them to climb in the Spider Climb in the second room. Several of the children's parents commented on how great everything was, from the cleanliness of the facility to how helpful and friendly everyone is. We were very pleased with everything, and my son had a blast!" "I've always done birthday parties at home (the kind you see on Pinterest), with family and friends. We moved here a year ago, so we didn't have any family here, just my son's Pre-K class and a neighbor or two. I was disappointed when my son begged to have his party somewhere else. BUT BounceU still let me have a theme and provide my own special touch to the decorations AND I was able to just enjoy the day without stressing. 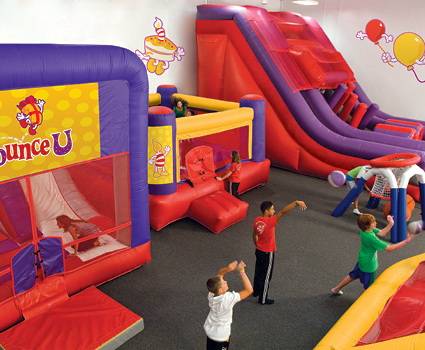 My son said that BounceU is awesome and it was the BEST birthday he's ever had!" "The staff did great! Quick to take care of any request. The teenages that work in this facility amaze me. They are professional, kind, good with the kids, and focused on your party at all time. The facility is always clean and the new slides were awesome and a great change for our fifth party!"